At present, there are 8 boats for sale in the Pacific Northwest and Alberta, and you can see them all on the Fleet One Buy&Sell page here. People who have expressed an interest in getting back into racing One Design, etc. If you have anyone in your orbit who fits that description, steer them to the Buy&Sell page and walk them thru the attributes of the various boats that are listed. In 2018 we had 9 boats change hands, 2 retained ownership, and 1 moved to BC from Ontario! Quite a development, and one that builds on the 7 or so boats that changed hands in 2017. So far in 2019 one Nanaimo boat and an Orcas Island boat have already sold, so perhaps this is the year we really clear out the modest backlog. 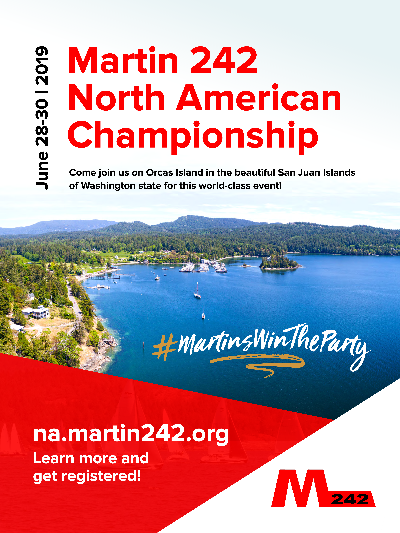 The 2019 NA’s will be at Orcas Island in Washington State on June 29/30, so use this as a selling tool with potential buyers, where they can join 25 other boats for some tight racing! The 2019 North American championship site is now live and the Notice of Race is available for download. The site includes detailed planning information on where to stay, moorage, how to get there, meals and food, health and safety, venue information, and more. Registration is also now open—early registration before May 15 is greatly appreciated for planning purposes (and it will save you $50 USD). The Orcas Island Yacht Club is working hard to make this a world-class event. Paul Ulibarri is confirmed as the Principal Race Officer and Alex and Sue Foley will bring Gatsby for the race committee platform along with their professional race management team. See a live webcam of the venue at the OIYC website. 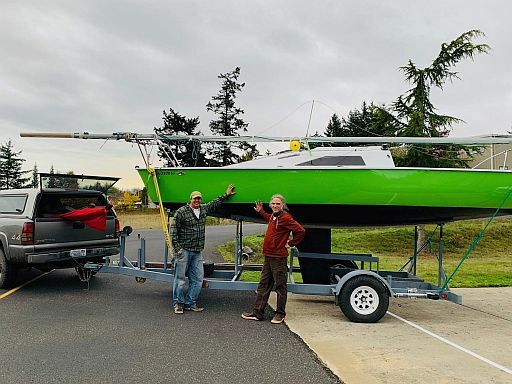 Congratulations to Chris Kaufman, on Orcas Island, who purchased ex-Blade Runner, ex-Arrow (95) from Chris White on October 28. It will continue to be raced in Westsound and may be renamed “Ekono Mart”. Enjoy your first 242, Chris! Congratulations to all those recognized at the Fleet Captain’s dinner on Oct 19. We had about 53 for dinner, with more arriving for the presentations after dinner. Special thanks to Adrienne Mennell who organized the pirate-themed event. Prizes were donated by Adrienne Mennell, Clare Strain, Martin Marine, and Paul Martin. Emcee, Fabian Hope maximized the comical chaos by having the 2nd and 3rd place skippers present the trophies to the true winner in most but not all cases. For the racing side, Michael Clements had a clean sweep, placing first in all four of the Fleet One Championship series: Fleet One’s Wednesday Evening Series, the In Bay Series, Out of Bay Series and the Fleet Champion series. Perhaps most notable in all his winnings were the first-place finishes in BIYC’s Martin Marine Round Bowen Race and the M242 North Americans at Cowichan Bay. As a keeper, he received a framed First Nations print with a plaque listing his accomplishments. He was also presented with a new perpetual trophy built by Ray Parsons for the Bloody Brilliant Action of the Season for his winning start of the Round Bowen race. His name will also appear on the Biggest Bloody Blunder award. Matt Collingwood received the Regis Challenge Compass Trophy for Most Improved sailor over the past season. Matt’s Dirty Dog was a consistent challenger this season and had 2nd place finishes in the Round Bowen and North American Regattas. In Fleet One’s Championship series, Matt was 2nd in the Out of the Bay and Fleet Champion series, and 3rd in the In the Bay series. He also won the Martin Bell Trophy as the best KYC boat of the season which was initially presented to Tim Murphy per the aforementioned comical chaos. As a keeper, he received a large stylized framed image of M242s racing (donated by Clare Strain). Reto Corfu and Phil Cragg on Back in Black were 2nd overall in the Fleet’s Wednesday Evenings series and 3rd in the Fleet Champion series. Alan Drinkwater on Simply Red was 2nd in the In the Bay series, Jim Hyslop on Second Wind was 3rd in the Wednesday Evening series, while Allan Strain on Shadowfax was 3rd overall in the Out of the Bay series. On the social side, Clare Strain was recognized as the Fleet Volunteer for services over the past years and her work on the North Americans at Cow Bay in 2018. She will be noted on the Mark Isaak Fleet Volunteer Award. As a keeper, she received a necklace made by Adrienne Mennell (the Fleet bought the raw pearls). Ian Dube from #27 Blow Out is moving to Toronto, so a framed set of photos showing his boat in action was presented before the dancing started.